After i finally managed to update the Tutorial section with all the new Tutorials in form of banners (check them out) i have again some space to look into the future. Don't miss to look at Yvonne's fat Article about Blending. Here we go with 2 fun bases i did beside. They were just build for fun as i was in the mood to build up some bases. I was in the mood for a change. When i look into my cabinet there is a lot of finished stuff, done on big sockets. I was in the mood of something more elegant. I did shot some pictures and maybe this could be an inspiration for some of you. I took a slim 4-edged wooden batten and cut it in small pieces with a saw. I planned to have two sides plain and to make this look good i choose to try a method i saw over at Jim's cool blog - Figure it out. 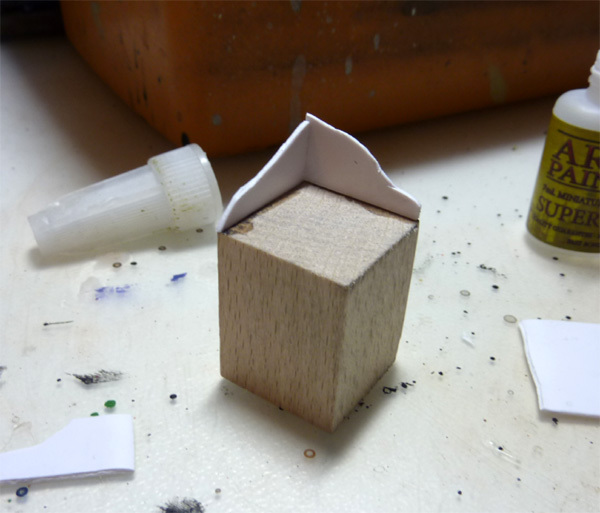 Using plastic card for the plain edges was my goal. 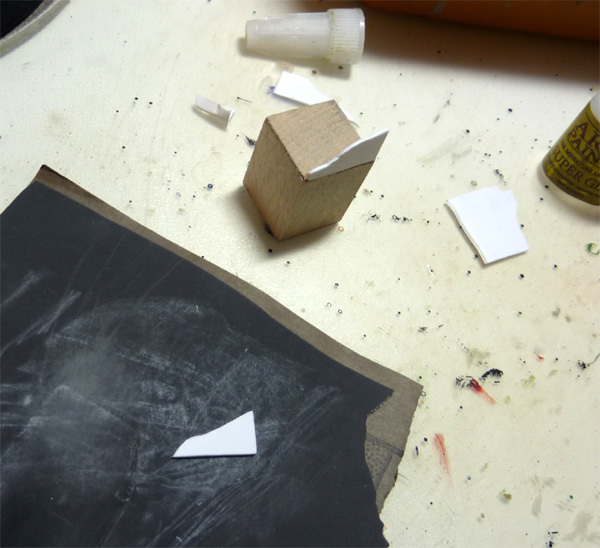 I did cut the plastic card into fitting pieces and made it clean from the cutting process by using fine sandpaper. Then i glued the plastic card in place by using super glue. Preparing Milliput Standard Yellow by mixing it together 1/1 to fill up the empty space. 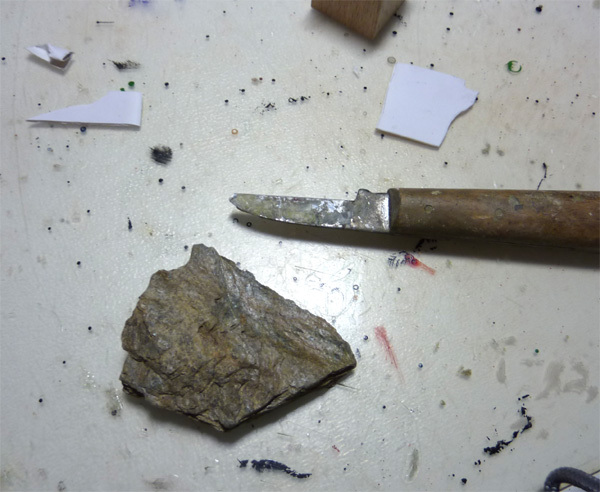 I also prepared some slate stones which i did cut in pieces with an old knife. Don't use a scalpel for such things, they are not hard enough and you might hurt you badly - old knife is perfect or you can also use a hammer - you know hammertime! 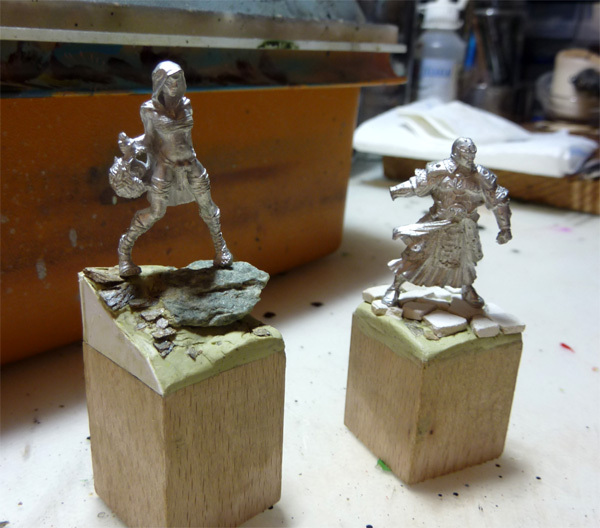 The models which i put up to the base are from the left, Pulp City's some kind of evil Little Red Riding Hood and a chinese warrior of Helldorado, both in 28 mm. I am not sure if i will paint them up soon, there is still something else to do but i was in the mood to build a base as i told you. After this step, do you prime the miniature on the display base and paint the miniature on the base or do you prime and paint them apart? I usually prime both together if the base is not build to high (for example a tree or a wall). 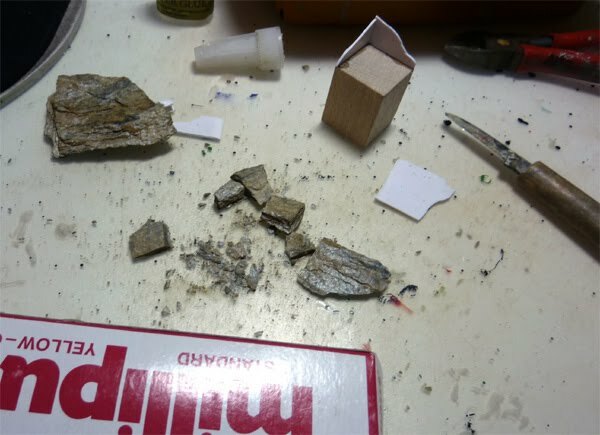 If I am able to reach every part of the miniature I will paint base and model together. If the base is to big I paint them seperatly.